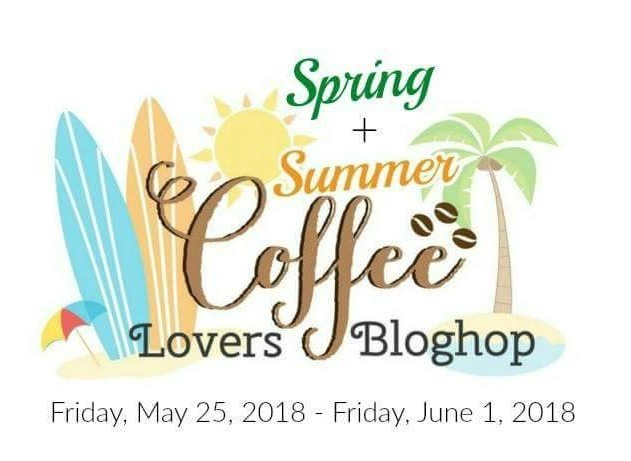 Welcome to Day 7 1/2 of the Spring & Summer 2018 Coffee Lovers Blog Hop! You have today and tomorrow left to link up for chances to win (and of course have a lot of fun!). Click on the main hop blog post here to find out all of the details and then play along! 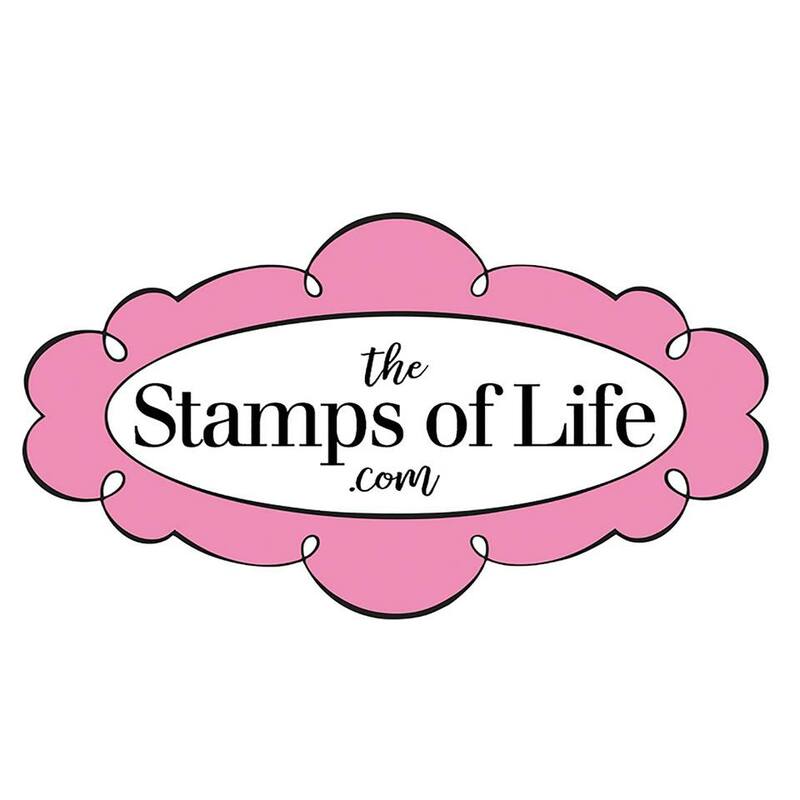 This afternoon I'm using some products from Sponsors Stamps of Life, Your Next Stamp and Our Daily Bread! Here's what I've got! 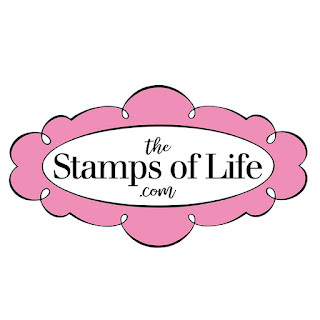 I don't know if you are familiar with Stamps of Life... I wasn't until a little bit before the hop... but you should definitely check them out! 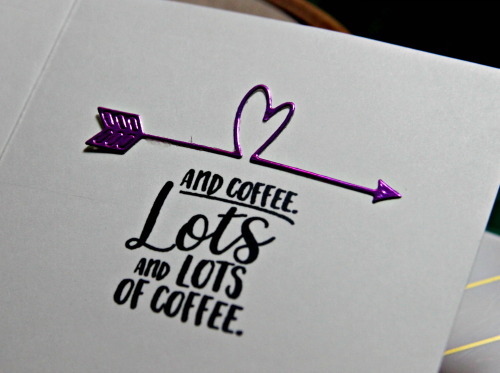 My first purchase included this awesome Coffee Statement set that comes with the Coffee word die as well as the coordinating outline die and a stamp set of very funny sentiments that go along with it! 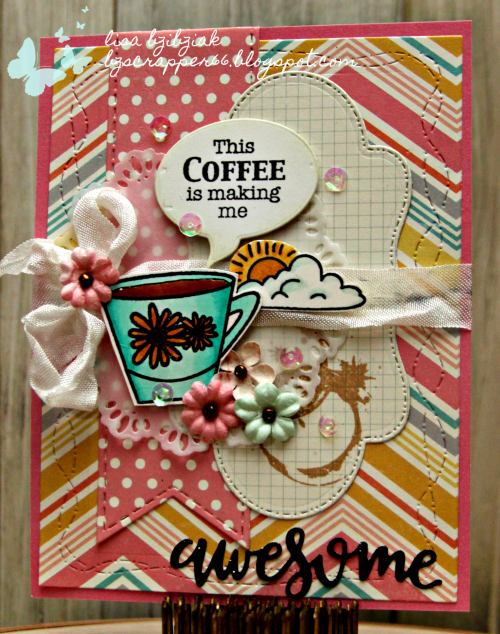 This Coffee die is large enough to be the star of the show along with the fantastic sentiments that come with it! I embossed this sentiment in some Penny embossing powder from Brutus Monroe and it was just what I needed! And I finished it off with that cute cup (not sure where I picked that up), flowers and these pretty glittery embellishments that I got from Your Next Stamp, but I'm not sure if they still carry this color. 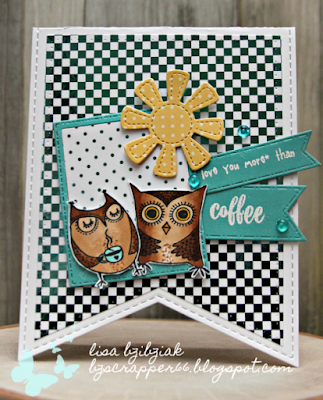 I'm entering this one into the Double Trouble challenge to use two or more patterned papers and because I'm playing along with the Coffee Lovers Hop I get two chances to win at Double Trouble! It runs through the end of the Coffee Hop! Thanks for stopping! 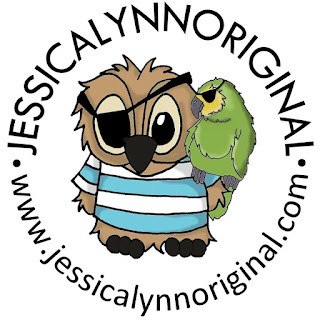 I'm still moving along commenting in the evenings after work... so I'll see you soon if I haven't seen you yet! 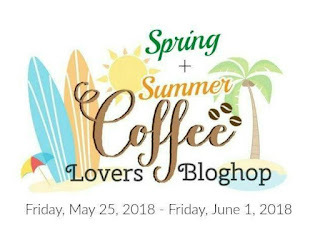 Welcome to Day 7 of the Spring & Summer 2018 Coffee Lovers Blog Hop! You have today and tomorrow left to link up for chances to win (and of course have a lot of fun!). Click on the main hop blog post here to find out all of the details and then play along! 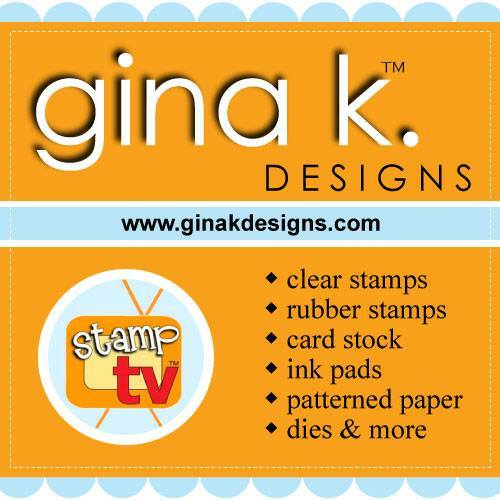 Today I'm playing with some Casual Fridays Stamps and dies along with some awesome Rainbow Decofoil that I got in the Gina K shop! 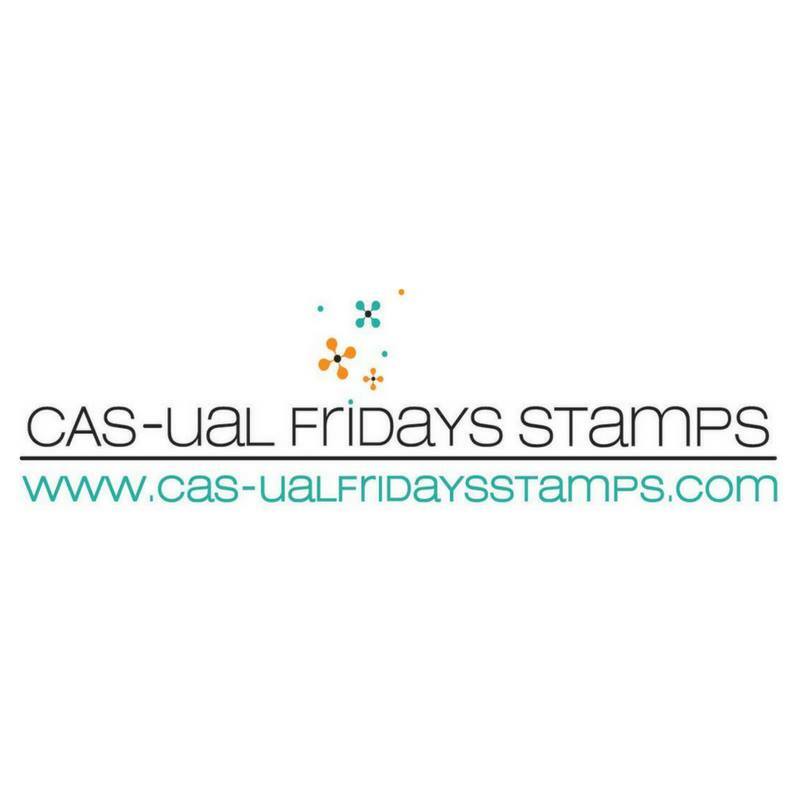 AND I'm playing along with the Cas-ual Fridays Birthday Celebration Challenge that goes through June 5th! I started off with some very cool white woodgrain paper from Hero Arts that #amymademebuyit. Just sayin'. 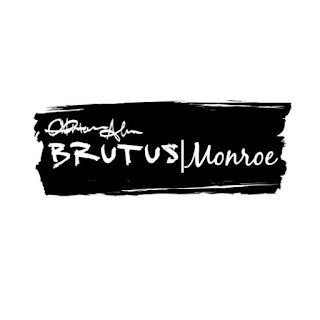 It's quite awesome! 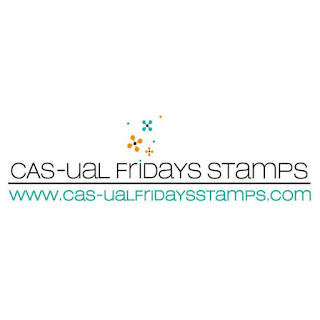 Super Sponsor Cas-ual Fridays has an awesome collection of Coffee and Tea products and you should definitely check them out! And while you're there... check out everything else too! 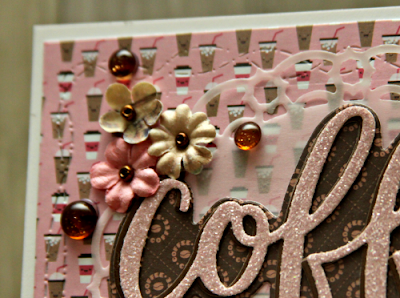 I love the Whole Shebang stamp set that I used to make this coffee card into a Birthday Card for the challenge! This cup. I can't say enough about this cup!! 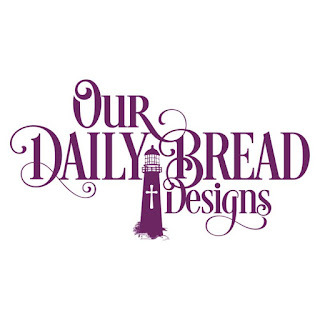 It's one of my very very favorites! 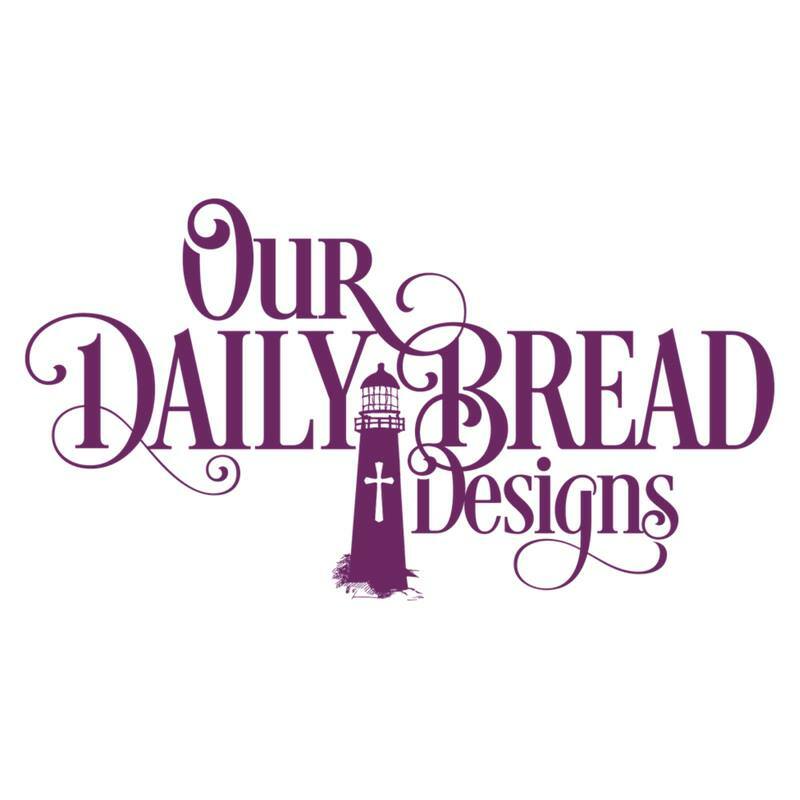 You can find the Coffee Cup Fri-Dies in the shop here. First, I printed the fantastic Coffee Bean Background from The Cutting Cafe onto some cardstock with my laser printer. 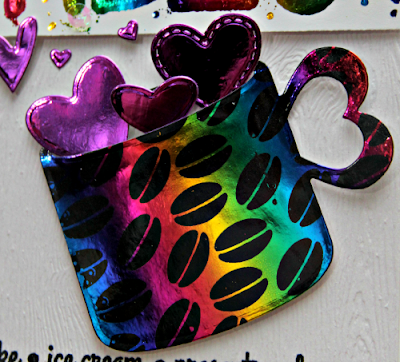 Then I foiled it with the Decofoil Rainbow foil and die cut the cup. 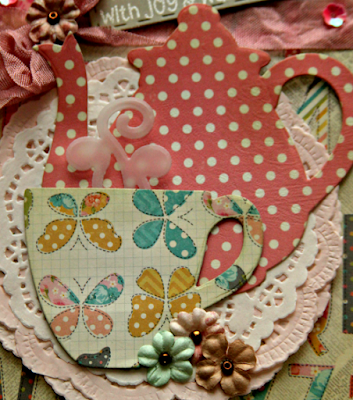 I filled my cup with various die cut hearts in different shapes and sizes. I cut them out of some pre-foiled cardstock in a pinky purple from my stash and I love how the color changes depending on the light. Here comes the fun! 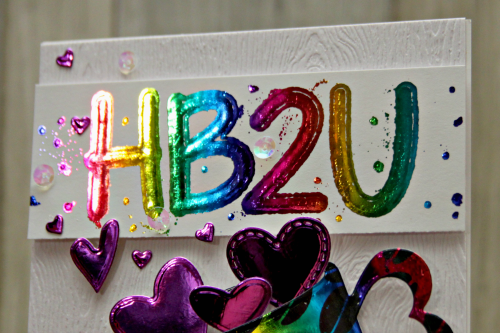 I heat embossed the HB2U sentiment from The Whole Shebang set in white on white. 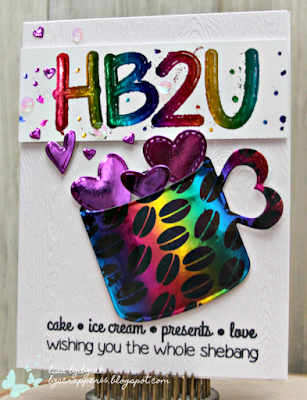 Then I used the Decofoil Adhesive Pen and traced over the HB2U and also added a few dots around the paper. You let it dry for a short while and then foil it. I'm not exactly sure how I got the extra splatters, but I was SO happy that it happened that way! Cool right?? And then I stamped this sentiment (one of the many awesome sentiments) from The Whole Shebang set. For this I used my Misti because of the bumpy woodgrain and it was good I did because I did need to stamp twice to get a good impression... and I'm happy! 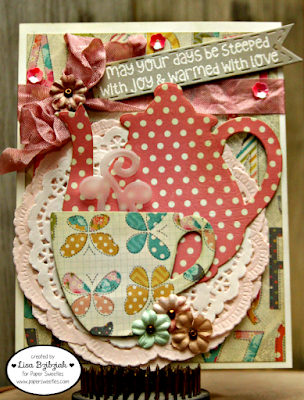 And just a peek at the rest of the sentiment on the inside... that stamp is from Verve Stamps and I love it! So that's how you make a coffee card into a birthday card! Thanks so much for stopping again! I'll have one more for today and we won't talk about what tomorrow is... see you soon! 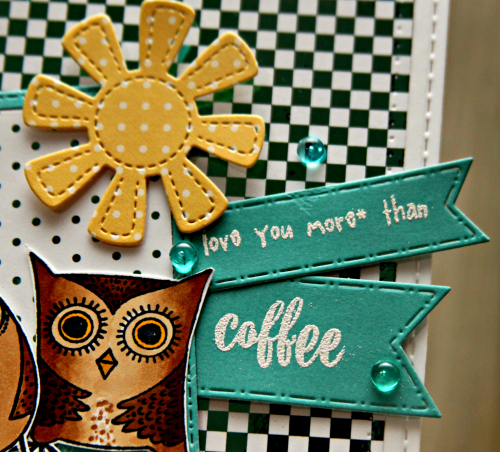 So I have a few other loves besides coffee... please don't tell my coffee... and Owls is one of the top ones! 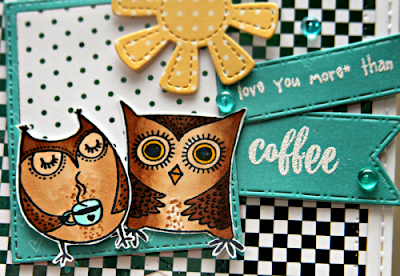 When I saw this Wise Old Owl stamp set by Gina K, I knew I had to have it... especially since one of these cuties happens to be drinking a cup of coffee! 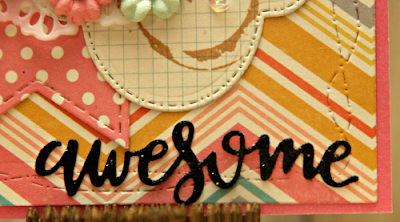 I started off by creating this banner shaped card using a banner die from my stash. I just folded my cardstock in half and then cut it with the die placing the top line just past the fold so it didn't cut that line in the paper... and voila! 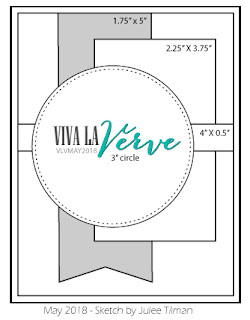 Shaped card! 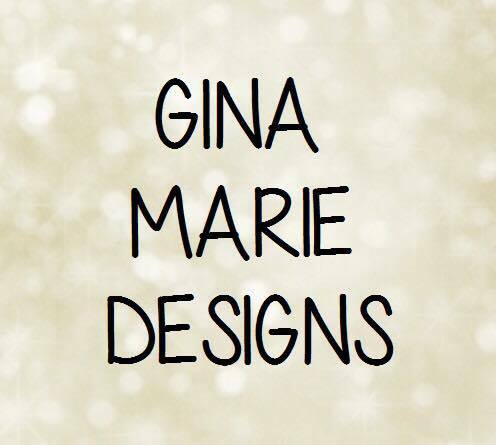 Then I took the next smallest banner and cut a piece of paper from Gina K's quite awesome Petite Patterns paper pad which is all black and white papers that can be foiled!! I chose the checkered pattern and some Turquoise Sea foil and ran it through my Minc... SO COOL!! Then I stamped, colored and cut out these two cutie pies from the Wise Old Owl Set... LOVE them! I decided I'd frame them with this cool polaroid die from A Jillian Vance's Stitched Dot Instant Photo Frame Dies. I decided to foil the inside square as well with some polka dots. 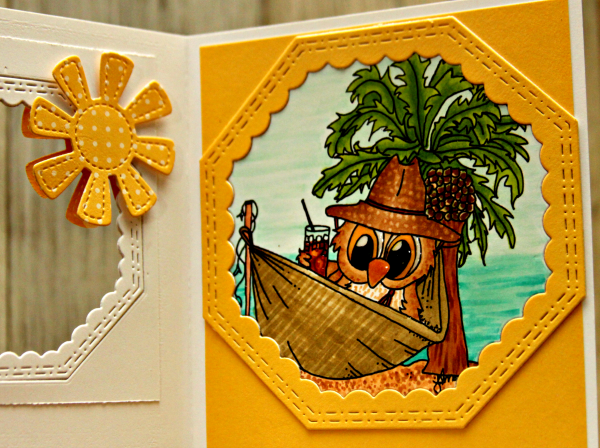 I decided a bright yellow sun was in order to lighten things up and then stamped my sentiment on two of the banners from one of my most used CDD sets, Flag Banner Dies. This cute sentiment is from Gina K's We Go Together stamp set which is all about coffee and doughnuts! I added a few Dew Drops and done! Just a gratuitous shot of the yummy shine! Thanks for stopping! 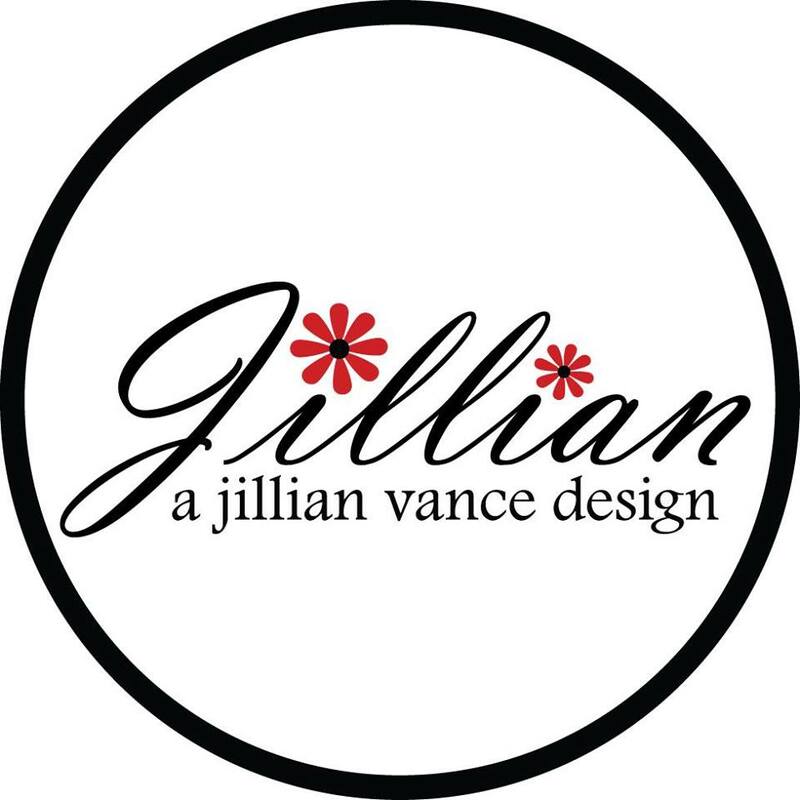 If I haven't gotten around to visit you yet, I will! 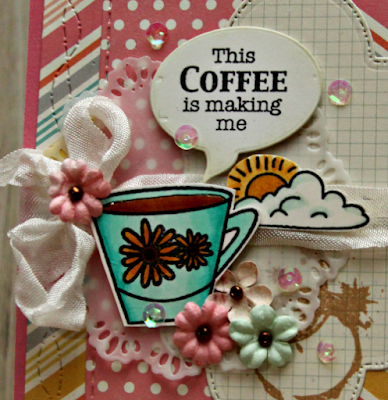 Stop back again tomorrow for some more... Coffee! Surprised? 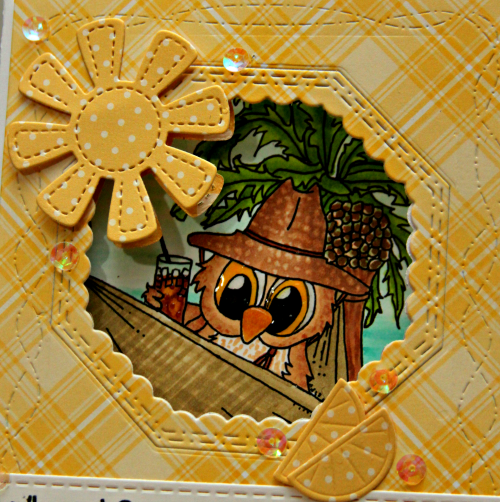 I decided early on I wanted to create this style of card with a window in the front and part of the Brentwood image peeking out. I used the Crazy Stitched Frame Die from CDD to cut my first layer and attached it directly to the card base. 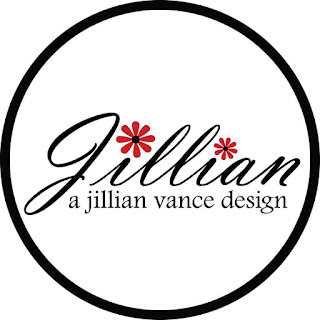 Then I lined up the medium Inside Scalloped Octagon Die where I wanted it to be and secured it to the paper with some washi so it wouldn't move... centering it between the two sides and a little higher vertically. I cut out the window and set aside the frame that was created. 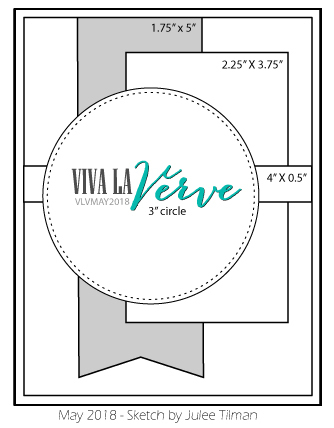 Then I made sure my image would line up where I wanted it before I cut that out with the largest Octagon in the set. I added back the outside frame by applying glue over the outside edge of the die on the inside of the front so that the glue was over the outer edge of the octagon and also on the card base. Then I cut a square slightly bigger than the octagon and cut another window out of it so that I could glue the square down around the scallop window and cover the tape that I used to hold the window in. And then glued the frame that was cut from that white square onto the backside of the frame I had attached in the front (with the plaid). Once I had that all figured out, I added that Sun die that from CC Designs (it's one of my favorite suns and it's no longer available) and we'll talk about those awesome lemons in just a bit! Then I colored my image with my Copics and layered everything on the inside of the card. I colored his hat first so that I could texture it with some burlap and some blending solution. I textured the hammock simply by swiping one way and then creating lines in the opposite directions... I didn't take a lot of time with it and did it quickly and I love the way it came out. The sky and water I created with flicks of various colors. This was really fun to color up! 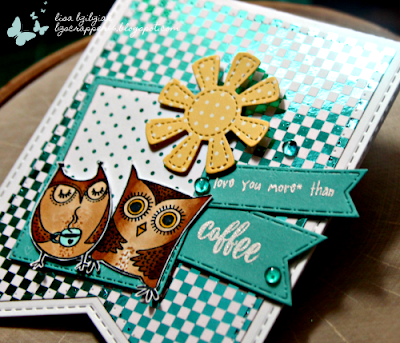 I'm playing along with the Double Trouble Challenge to use two or more patterned papers and because I"m also entering the coffee hop I get too chances to win over there! Thanks for stopping! 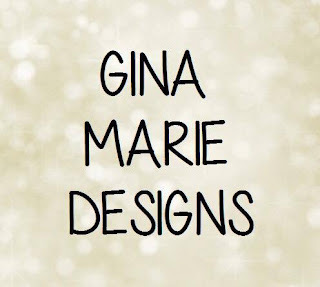 I'll be back later with a second project for today! 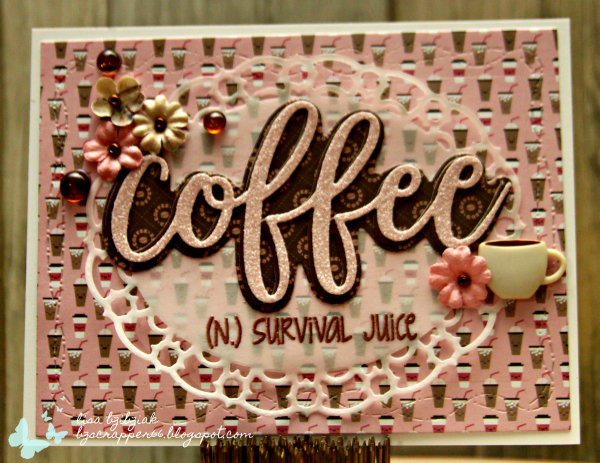 Playing along with the Spring/Summer Coffee Lovers Blog Hop again today as well as the Viva La Verve Sketch Challenge for May and the Double Trouble Challenge to Use Two or More Printed Papers and create something that fits the Coffee Lovers Hop! 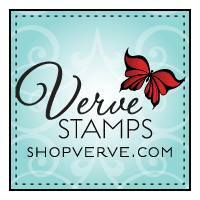 You should check out all of these! STILL working on that Simple Stories paper pad. 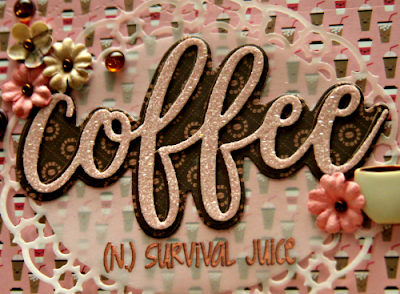 I cut the base layer using the Crazy Stitched Frame Die and that pretty label using the Fancy Stitched Label from Craftin Desert Divas! The Fishtail banner is from MFT. 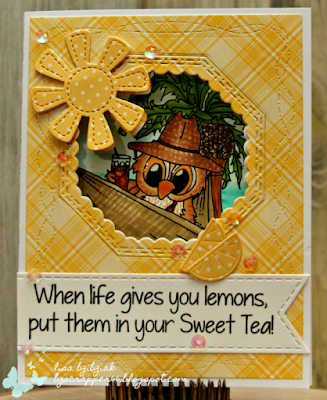 It was fun to create this whimsical scene with the cup, sun/cloud, and coffee stain from Verve Stamps! 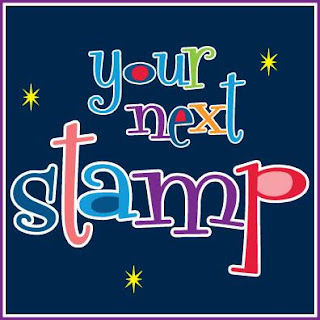 The cup and flower and coffee stain are from the Better With You stamp set and the sun/cloud are from the Fill My Cup stamp set. 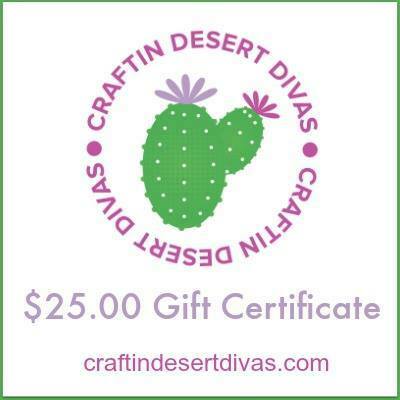 That pretty vellum doily is from Gina Marie Designs and the ribbon is from D.L. 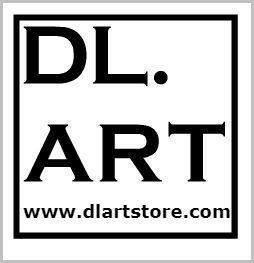 Art! I built my sentiment using the stamp from my stash above so that I could use this Awesome word die from Verve! Hope you find some time to play! Welcome to Day 5 of the Hop! 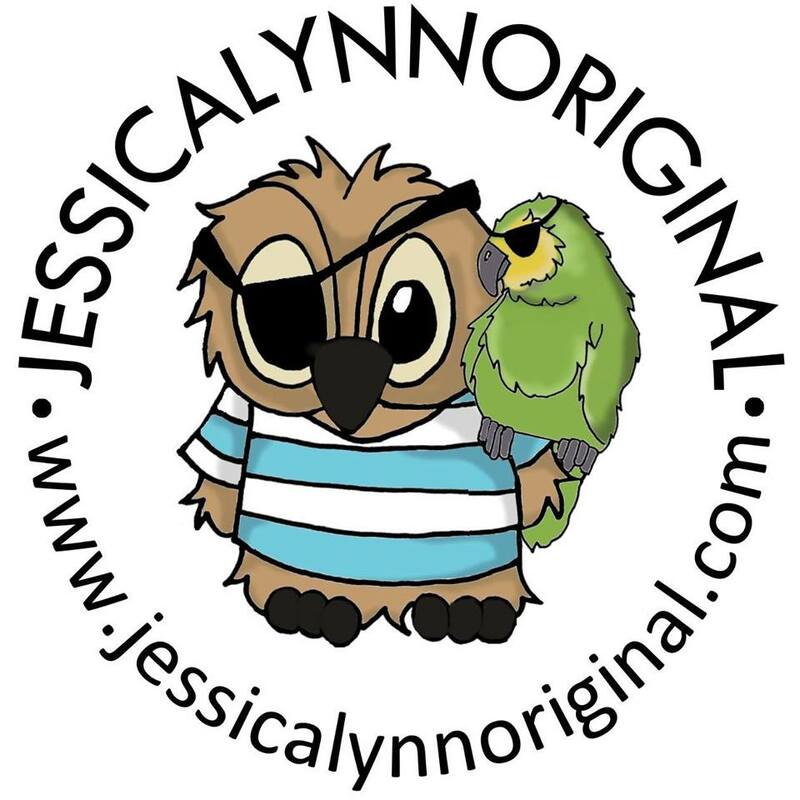 If you've never heard of it before, check out the main blog post here! 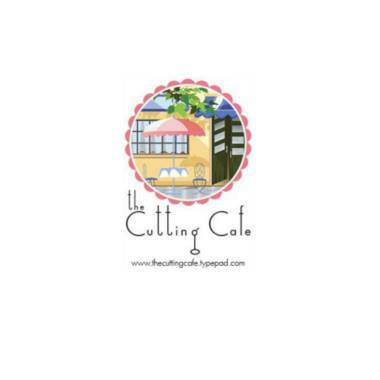 Tons of sponsors and tons of prizes for linking up a newly created project with a Coffee, Tea or Cocoa and Spring/Summer theme! All the details are on the Coffee Loving Cardmakers Blog! Today I'm playing along with some of the awesome Coffee/Tea products from Paper Sweeties and still working on using up that Simple Stories paper pad! One of my favorite cup dies is the one from the Keep Calm and Drink Coffee Sweet Cuts (not to mention the awesome steam I cut from vellum) and this Teapot from the Tea for Two Sweet Cuts follows close behind! And this sentiment from the You Warm My Heart Stamp set ... so sweet! 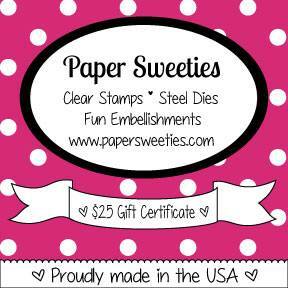 And of course I added some beautiful wrinkled seam binding and sequins from the Paper Sweeties shop! I'm also entering this card into the new Double Trouble Challenge to use Two or More Design Papers and that will fit the Coffee Lovers Blog Hop Challenge... you should go and check out the details... very fun concept!